Tested and inspected to ensure cartridge's quality. Toshiba T-3560 Black Toner Cartridge - Copier toner is designed for use with Toshiba BD3560, 3570, 4560 and 4570. 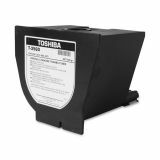 Toshiba supplies are specifically designed to work in Toshiba products. Demanding specifications, high-quality standards and vigorous testing ensure the highest-quality product that will work best with your equipment. OEM-made for proven quality, this cartridge yields 13,000 pages.